Start your tour at the small Hohenschönhausen Municipal Cemetery in Gärtnerstraße, where DenkOrt serves as a memorial to the inmates who met their deaths after World War II in the “Specialised Camp No. 3” of the Soviet Secret Service (NKVD) due to hunger, cold and sickness. 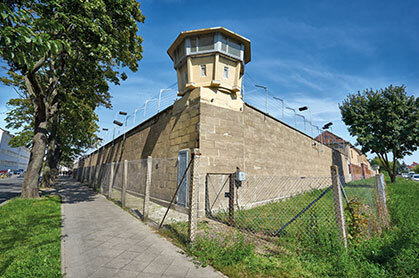 Some 20.000 people were incarcerated in the camp from May 1945 to October 1946. 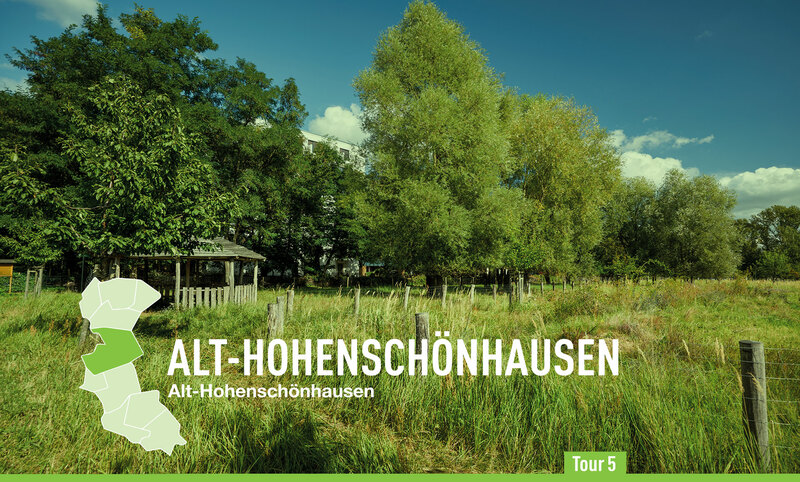 Walk to Hauptstraße and you reach the historical centre of Hohenschönhausen. The origins of the Tabor Church date all the way back to the 13th century. This fieldstone church is adorned by an altar to the Virgin Mary from 1450. Next to the church is the former Gutshaus (manor house), estimated to date back to 1690. The noble von Röbel family lived here until 1736, while later residents included the Prussian State Secretary Scharnweber and – in the 1920s – Paul Schmidt, inventor of the dry cell battery and torch. Today a charitable organisation manages the house as the Bürgerschloss Hohenschönhausen and invites visitors toa variety of events. Now you can continue on foot or with the M5 tram to the Mies van der Rohe House. This monument from the Classical Modern period is located at Oberseestraße 60. It was designed by Ludwig Mies van der Rohe for the Lemke family in 1932. The garden for the house was designed by the Karl Foerster Studio. 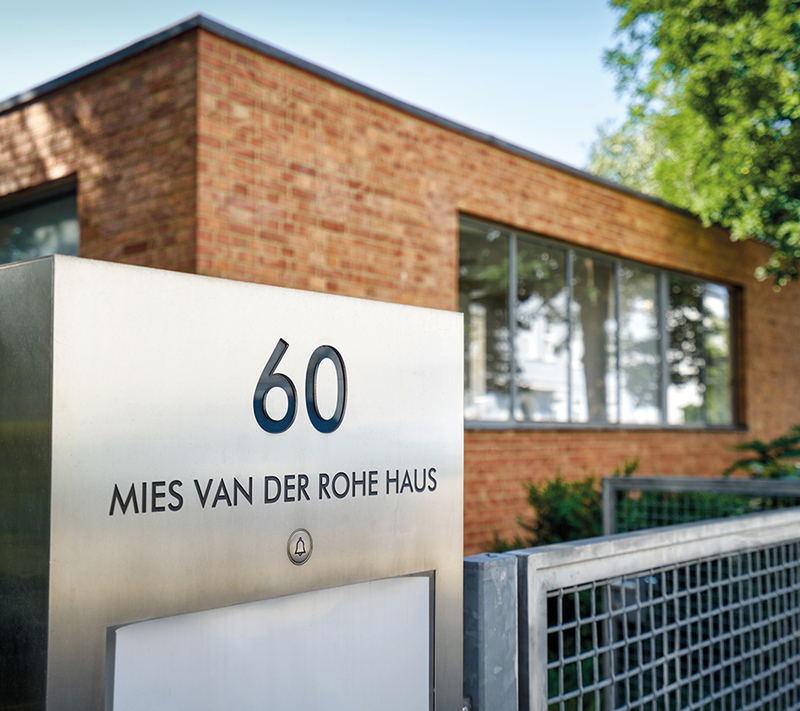 Today the Mies van der Rohe house is a space for art, attracting thousands of visitors from both Germany and abroad. 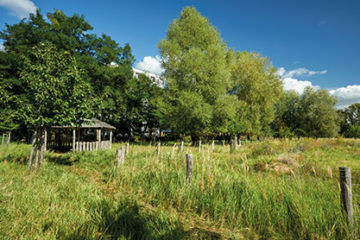 At the end of Oberseestraße, the swimming beach at Lake Orankesee has invited swimmers both in summer and winter ever since the 1930s. 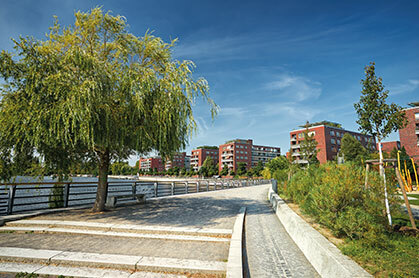 Enjoy a pleasant time at the lake terraces at Orankesee. 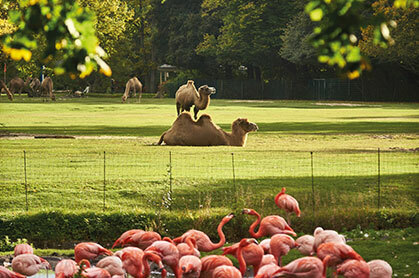 Continuing your tour, you will pass through the scenic park landscape between Obersee and Orankesee lakes. 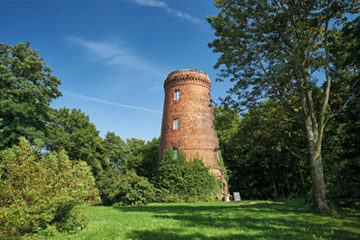 You can round off your walk at the café bar in the historical water tower. 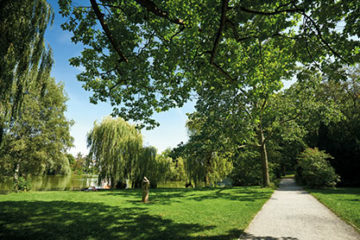 The terrace provides a wonderful view over the idyllic Obersee. A short walk takes you back via Konrad-Wolf-Straße, Strausberger Straße and Große-Leege-Straße directly to the Flußpferdhof residential complex designed by the architects Mebes and Emmerich, and takes its name from the sculpture “Zwei Pferde im Fluss” (two horses in the river). 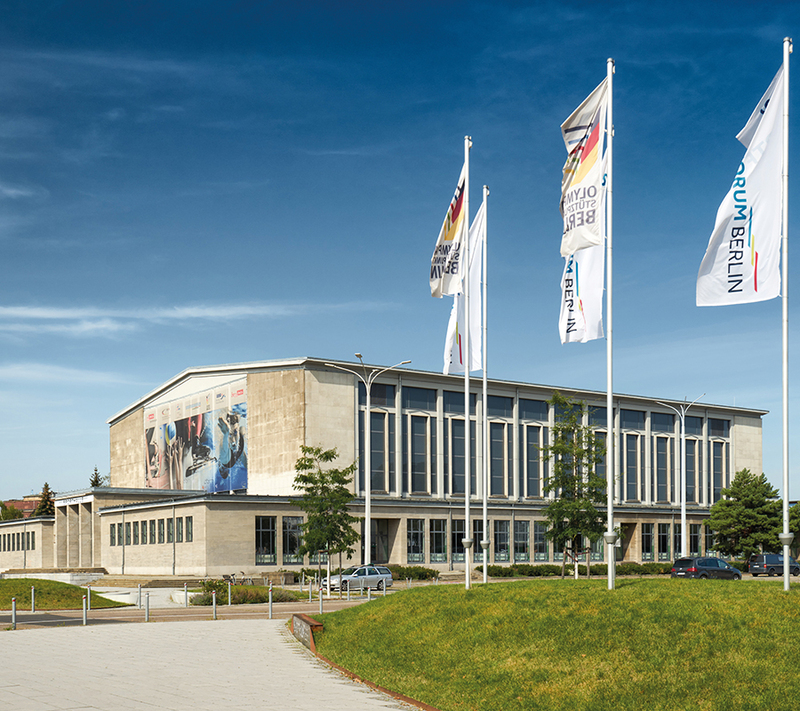 The tour ends at the Sportforum Berlin, where the Berlin Olympic Training Center is located, a base for top-class sport. The Lemke country house, designed in 1932, has been a listed building since 1977 and has been open to the public as an architectural memorial since 1990. 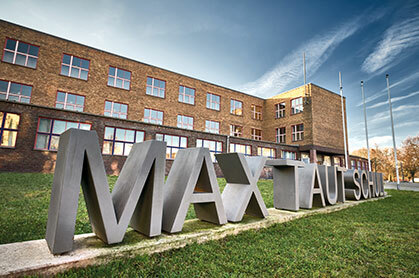 The monument is used as a gallery with changing exhibitions of modern art, thematic tours and lecture series.